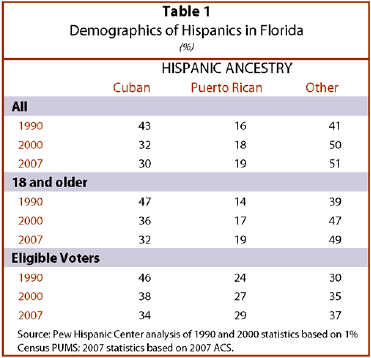 However, the final 2008 general election voter registration figures from Florida, along with recent data from the U.S. Census, show significant changes in both the political leanings and the demographics of Latinos in the electoral-rich Sunshine State. According to the Florida Department of State Division of Elections, Latinos make up 12% of all registered voters in Florida this year, up from 11% in 2006. Their move toward the Democratic Party is part of a broader realignment among the overall electorate of the state. Today, there are 657,775 more registered Democrats than registered Republicans in Florida. 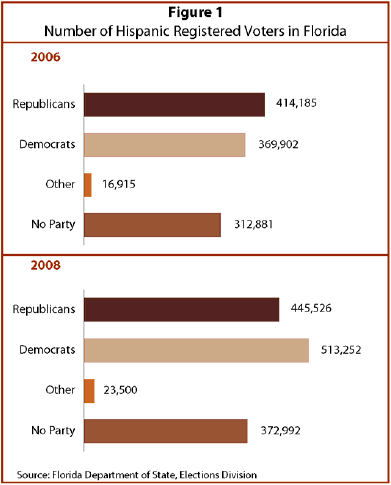 In 2006, the Democrat registration advantage was smaller – just 283,856. With 27 electoral votes, the battleground state of Florida is once again playing an important role in a presidential election. And, in a year when interest in the election is running high across the country, more Floridians are registered to vote than ever. According to the Division of Elections, 11.2 million Floridians are registered to vote, 8% more than in 2006. 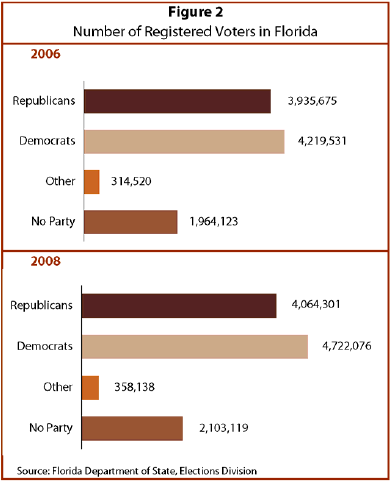 Voter registrations among Hispanics in Florida are also higher this year than in 2006. More than 1.36 million Florida Hispanics are registered to vote, up 22%.